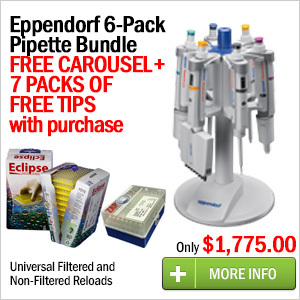 Pipette.com announces an exclusive Eppendorf 6-Pack Pipette Bundle, a new promotion on the Eppendorf Research plus. The promotion is designed to help researchers increase productivity with a comprehensive set of 6 adjustable-volume Eppendorf pipettes, 6-place carousel stand, and 7 racks of pipette tips. With the Eppendorf 6-Pack Pipette Bundle, lab technicians can venture to create reproducible results and save $213.70 (or 10%) off list price. 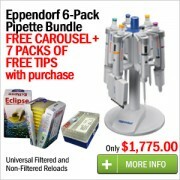 To learn more about the Eppendorf Research plus 6-Pack Bundle, or any other Eppendorf pipette specials, visit http://pipette.com/eppendorfpipettes. Pipette.com is an official Eppendorf® distributor, providing a broad Eppendorf portfolio which includes pipettes, pipette tips, tubes, and lab equipment. Pipette.com runs the largest independent pipette calibration & repair facility on the West Coast and is a major distributor of liquid handling products.